Chris Bryan is a world renowned, award winning cinematographer. He has been at the cutting edge of the surf industry for the past 15 years. Chris is the ultimate water-man who uses all mediums but specialises in high-speed cinemaphotography. When Chris is not travelling, he is based in Sydney, Australia. Most of his work is in the field of action sports cinemaphotograph used in feature films, commercials and television. 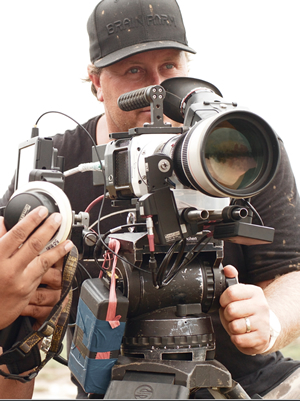 Chris is not only a Phantom camera operator, but has studied in New York to become a qualified Phantom technician. Chris has worked closely with the creators of the Phantom camera to create his own unique custom light weight self contained underwater housing for the new state of the art Phantom Flex 4K complete with Directors underwater video split. What sets Chris apart from others is his creative eye and his ability to get the shot in the most extreme situations. One of Chris’s strongest attributes is his incredible versatility and consistency. Chris’ ability to capture images from land, air or water angles on multiple formats, under various conditions contributes to his outstanding reputation.